Across the width of the window a profile a view of the town is depicted, showing its three main churches, ( Methodists in the LH, St MichaelÆs Cof E in the centre and United reform RH) one in each light amongst the buildings and a general impression of the typical architectural style of the town. This echoes the reality of the situation as one gets a memorable view of the town against the skyline, from a distance on the Northern side. In the centre light beneath the town is a plaque with the text: "A city that is set on an hill cannot be hid" [Mat 5:14]. Moving to the very base, fossilised ammonites are seen. These ancient remains are to be found locally in the ground as the area was once part of the sea millions of years ago, linking the present with a reminder of the earliest forms of life. Around the ammonites will be painted textures and colours of the earth, rock like strata which forms a solid foundation for the town. In the right hand light this strata is more pronounced û rising higher it gradually changes to textures of stone walls, brick construction, brief glimpses of steps and arches hinting at the architectural foundations and cellars built beneath the houses which then merge into the buildings above occupied by the townsfolk. (DETAIL of above) St Michael and All Angels ,Highworth, Nr Swindon. In the other lancets we have something similar but more of the green plant life which is vital to the health of mankind and the planet and the air we breathe. We may also catch glimpses of, flowers, and arable crops etc., typical to the locale around the town. In the centre lancet an area of water is revealed as that crucial element which is present in all of life. Looking higher again, above the town, through the area of sky we encounter some rainy weather and rays of light. Then looking up into the tracery we see stars and other heavenly bodies against the darker blues. One or two planets might be shown, Hale Bopp Comet which places it in the context of the end of the last millennium, the moon to the side and the sun in the centre. All of this is encompassed under a splay of feathers, the wing like embrace of God. Finally, the inscriptions at the base of the window, on the left side is simply Highworth. In the centre the lines from a hymn, ô God is working his purpose out as year succeeds to yearö. At the base of the right hand light will be a copy of The first page of the parish register and then below that, simply ôAD 2000ö. “The window is in a prime position in the West Wall and my intention in creating the image was to keep predominantly to ‘blues’ in varying hue and tonality, but punctuating areas with some brightly contrasting points of other colour. Depicted in the central light are the figures of Christ and John the Baptist standing in a pool of the River Jordan, and in the background water forms a background, falling from above. The abundant water and cascading foliage, some bearing fruits, are depicted to give an impression of bountiful richness of an ‘oasis’ setting in the desert. The Dove, symbol of the Holy Ghost, is hovering emanating light in the centre above the figures. The figures are quite formerly painted in contrast to the free style of the water and foliage. Care was taken to ensure sufficient natural light still enters into the building. 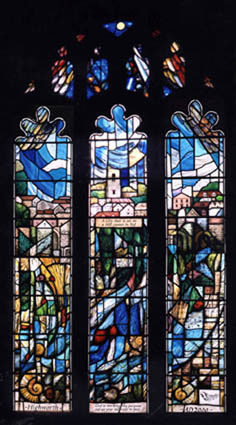 As with most of my work generally, this window is treated in quite a painterly fashion using traditional techniques of fired vitreous paint to create the image, combined with silver stain for yellows and gold, and limited acid etching. I did several impressions and in one of them introduced the feeling of landscape with lots of water and natural forms, thus relating the sun motif to the earth and life. After some discussion with Fr Tom, this is the design which was finally chosen. The shapes had become less random, the impression became a design which had moved a long way from the original starting point. Nevertheless, throughout the work there is a strong element of improvisation. The cartoon (full size drawing) was executed quickly with a lot more detail than originally envisaged. Foliage grew in all directions, even a few insects and animals appeared. Water is also a main theme of the window. It is there in the central light as a river and appears in a variety of ways throughout the window. It is a basic element in all of life. I think the window is about life on this Earth and all the elements of nature; the sun, sky, water, earth and all things growing. The plants may be recognisable or at least they should look familiar. There are no people depicted but their presence is hinted at in the ploughed earth and growing corn and also the human element is in the onlooker." EAST WINDOW, St Helen's Church, Gumley, Leicstershire. This window installed in March 2005, replaced a window made by Burlison & Grylls in 1876 but which was greatly disfigured by paint loss, a problem typical of the period due to new experimental painting techniques. A serious investigation was made to consider ways to conserve the original window but the conclusion was that whereas some parts might be recovered and conserved but other areas could continue to decay in time. The brief was to make a similar composition of the Crucifixion of Christ, but to add the figures of St Helen and St Francis in the outer lights. Christ on the Cross is looking down in repose, flanked by Mary and John looking upwards in prayer. St Helen is kneeling and holding a small cross and below her is a sheep. St Francis is standing holding a dove, a reminder of the Holy Spirit which is seen in the topmost quatrefoil. A fox runs past St Francis’s feet towards a tangle of brambles which spans across the base of the three lights. The brambles symbolise the chaos and pain that life can bring, but rising up through the ordering of light and rays in the background of sky, the eye is lead up to the calmness of the Holy Spirit. The fox and sheep could be regarded as symbols of opposites, seen here existing in peace and accord together, and they also reflect the rural aspect of life in the Gumley area. It is worth noting that the donors of the new window are descendants of the donors of the earlier window.